This fall, Miner athletics fans will begin to see a refreshed visual identity as S&T’s 17 varsity teams transition to an updated set of design elements. 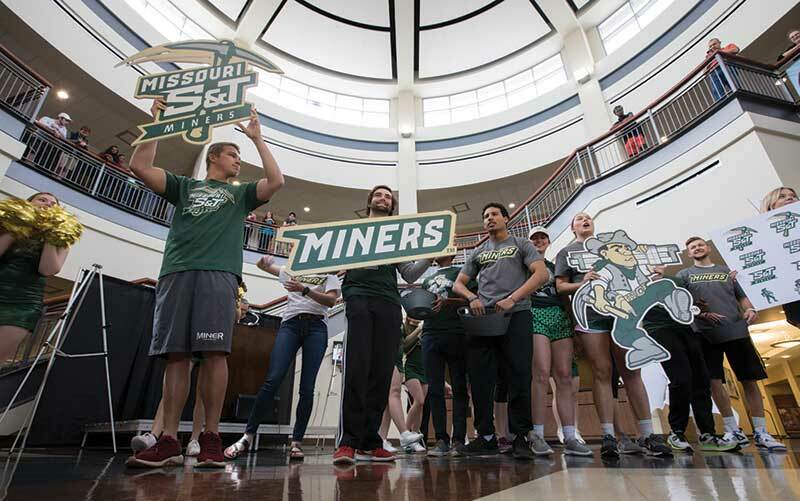 They include an updated athletic logo, typography and spirit marks like those pictured above, displayed by student-athletes at a campus reveal. The new look will be rolled out in stages and will be transitioned to every team over time. The new Gibson Arena, which is set to be completed in August, will feature the new design elements. Gibson Arena is named in honor of Kristie (Capps) Gibson, EMgt’74, and John Gibson, EMgt’74, whose recent $1 million gift to S&T athletics supported major renovations to the arena in the university’s Gale Bullman Building. Read more on page 48.